Today i will be discuss how to Link Aggregation Configure ZTE GPON OLT. LACP is a method to control the bundling of several physical ports together to form a single logical channel. LACP allows a network device to negotiate an automatic bundling of links by sending LACP packets to the peer (directly connected device that also implements LACP). The logical channel on the ZXA10 C220 is called smartgroup, which has the same VLAN properties as Ethernet port. 2. Use the interface smartgroup command to configure smartgroup. 3. Use the smartgroup load-balance command to configure load-balance mode. The default mode is based on source and destination MAC addresses. 4. Use the interface command to configure interface configuration mode. 5. Use the smartgroup mode command to configure smartgroup port and mode. On: The port runs static trunk. Both end of the aggregated link should be set to the on mode. Active: The port runs LACP in active negotiation mode. Passive: The port runs LACP in passive negotiation mode. It is recommended to set one end to active mode and the other end to passive, or set both ends to active. The VLAN attribues of a member port should be consistent with that of the smartgroup. Otherwise, the port cannot be added to the smartgroup. 6. 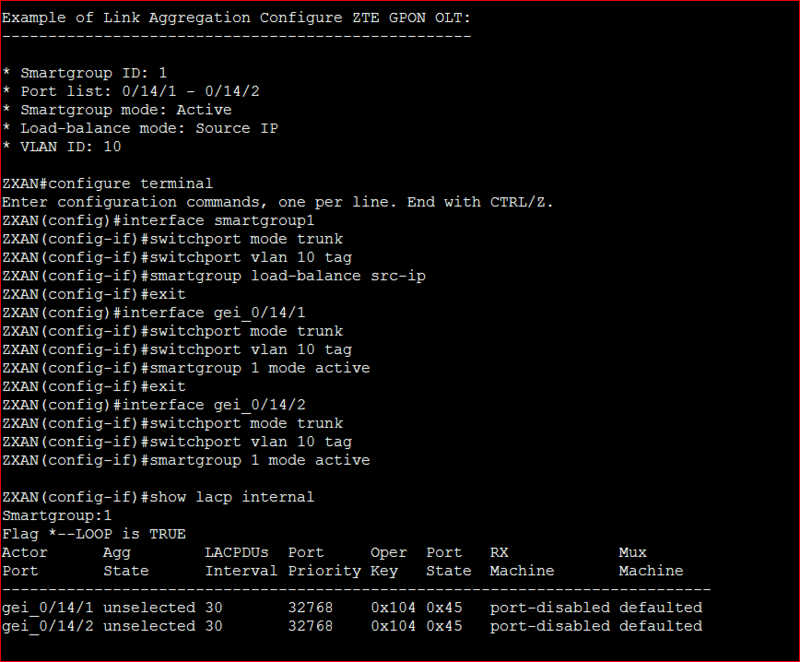 Use the show lacp internal command to query smartgroup configuration.